File photo of traffic in Ginza, downtown Tokyo. Japan may backpedal on its pledge to cut greenhouse gas emissions by a quarter, an official said Wednesday, dealing a further blow to already deadlocked global warming talks in Doha. Japan may backpedal on its pledge to cut greenhouse gas emissions by a quarter, an official said Wednesday, dealing a further blow to already deadlocked global warming talks in Doha. Tokyo in 2009 promised it would slash its planet-warming emissions by 25 percent from 1990 levels by the start of next decade—provided other major polluters such as China and the United States also make sharp reductions. The target was one of the most ambitious of any industrialised country and won plaudits from environmentalists. But officials say with a huge rise in the use of fossil fuels since the nuclear disaster at Fukushima put Tokyo's atomic energy programme on hold, the pledge will be difficult to fulfil. 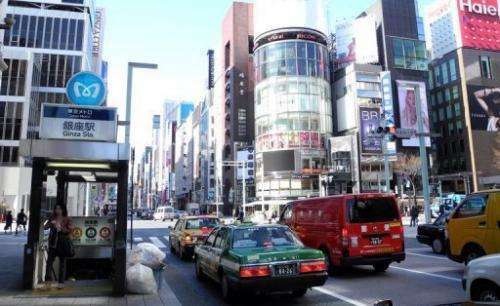 "Japan is discussing how to achieve its pledge of cutting greenhouse gas emissions by 25 percent by 2020, including the possibility of revising it," Shuichiro Niihara, an official at Japan's environment ministry, told AFP. United Nations chief Ban Ki-moon talks speaks at the Summit of the United Nations Framework Convention on Climate Change (UNFCCC) in the Qatari capital Doha on December 4, 2012. Ban has urged negotiators to put aside their quarrels and act with urgency to find the money and agree on mechanisms to tackle the global warming "crisis". "The goal was set before the nuclear accident last year, but even with nuclear power generation, it was going to be very difficult to realise," he said. The earthquake and tsunami of March 2011 sent reactors at the Fukushima nuclear plant into meltdown and generated widespread distrust of a technology previously used to provide around a third of Japan's electricity. Japan's compulsory goal of cutting emissions by six percent by 2012 is however likely to be reached, said Niihara. Average emissions between 2008 and 2010 were 10.9 percent lower—if carbon trades with developing countries and forest sinks are taken into consideration. Carbon trading is a system in which caps are put on emissions from a company, an industry or a country. Unused pollution allowances can be sold to those wishing to exceed their allocation. 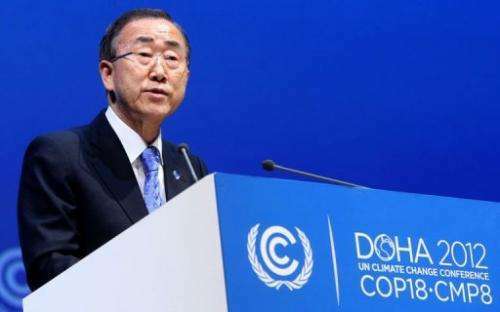 UN Secretary-General Ban Ki-moon urged negotiators at climate talks in Doha on Tuesday to put aside their quarrels and act with urgency to find the money and agree on mechanisms to tackle the global warming "crisis". Despite more than a week of late-night efforts, parties remain in disagreement over the details of extending the life of the Kyoto Protocol on curbing Earth-warming greenhouse gas emissions, and funding Third World climate projects. In Doha, Japan is pressing to have the Clean Development Mechanism (CDM) carbon trading scheme incorporated into the counting system for measurements from 2013 onwards, the official said. In many ways, Japanese society is very admirable. But the Japanese cannot stop a wave that is international in nature.